Domain Name Investing – How Much Money Can You Make ? Netspaceindia / Domain Names / Domain Name Investing – How Much Money Can You Make ? 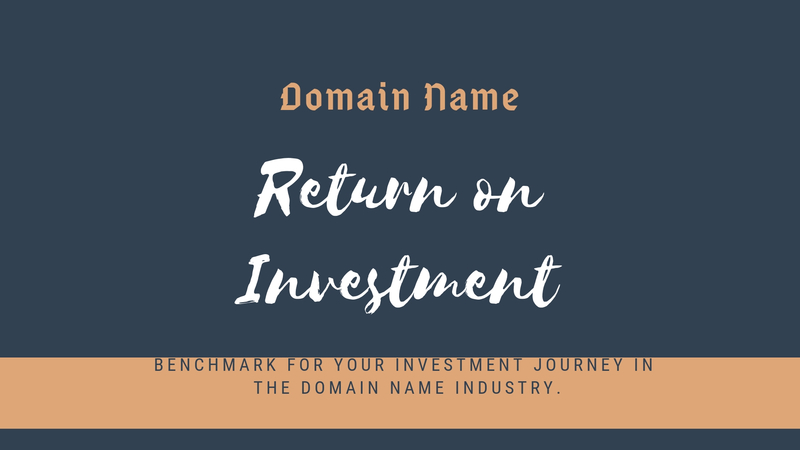 Domain Name Investment is a new era of investment, Domain name investing is like investing in a real state of the internet. This article can be a benchmark for your investment journey in the domain name industry. What is domain name investing? The right way for selecting a domain name for investment? Is there any risk involved, domain name investing? How much money can you make from domain name investing? Building a right Domain Name Portfolio. Setting a right Domain Name Pricing. Where to sell your domain name? Creating a list of potential buyers for your domain name. Zero Investment Domain Name selling method. The Hustle of domain name investment. In 2009, insure.com got sold for $16 million which is equal to Rs. 1,14,46,40,000 (as per today’s exchange rate value) which have set the world record. The result is a unique opportunity for investors to invest in domain names that can be sold for a profit in the future. But that does not mean that every domain name will be valued that high, still lengthier domain names are normally sold from hundreds of dollars every day. Domain names are hot commodities of today’s tech-centric world and for the good reason. Typically, Domain Name Investment in the real world, this means you register a cheap domain name and sell it for the profit to the buyer. Domain Name investing required looking into the future. For layman explanation lets take an example of a most common method of investment “Indian stock market”, you buy a stock for a cheaper rate and wait for the right buyer and for the right time so you can sell at a higher price. This is what exactly we do in domain name investing, We buy a domain name from the open market or hand registering them and then selling it to the right buyer at right time. Sometimes, even you are not aware of the value of your domain name. Before you start investing in any kind of commodity (Including Domain Investing) you must know the difference between an asset and a liability, and buy assets only. Don’t buy a domain name that you think is cool or may have high value. Only buy a domain name which people are looking for or paying for placing ads on the same keyword. Just like stock market “Buy a stock people are buying” always do keyword research before buying a domain name If you are trying to book a domain name for investment. I personally recommend keywordrevealer.com for doing your keyword research. The above is a screenshot is taken from the keyword planner. As you can see the keyword “leaf blowers” is having a good search of 74000 per month, which make leafblowers.com a good candidate for an asset for my domain name investment portfolio and at the same time leafblowersbackpack.com can be a liability. Remember, once you buy a domain name for an investment prospectus, it may take years to sell it to the right buyer and if you are buying a liability then you have to bare the renewal charges every year. If a high searched keyword domain name is not available in .com TLD, try looking for other extensions. As you know Netspace (India) provide more than 900 types is TLD’s for registration. You can also look for a brandable domain name which is short and easy to remember. and you look at k.im purchased by funder of Megaupload who is also know for the first person to legally changed his surname as .com in 2005.
but keep in mind, that even if you buy the shortest domain name of someone name, you have to wait for that person to become a millionaire before he can afford to pay you the right value of your domain name. As a rule of thumb for any kind of investment “Always buy cheap and sell at the higher cost” and the same should be applied in domain investing. You can either handpick domain name based on your research and pay a cheap domain name registration charges and sell it to the buyer at higher cost. like all investment, there is a risk involved. The biggest risk is that you end up having a huge list of liability. Also, make sure you don’t get drunk and start buying a domain name without doing any research or you may end up blowing all your saving or credit card limit. DON’T BLOW YOUR SAVINGS. NEVER RUN UP CREDIT CARDS. SAVE YOUR INHERITANCE. AND DON’T EVEN THINK OF QUITTING YOUR DAY JOB EITHER. give time to your domain investing skills, I will say minimum 5 years. let me tell you story of a man called “Rick Schwartz”, once you spend some time in domain investing you will surely start hearing a name “Risk Schwartz”. he started in the domain investment market with a total investment of $1,800 (Rs.1,29,14/-) and wound up earning $20 million (Rs.1,43,49,00,000) over the span of 8 years. He is the founder of http://www.erealestate.com/ and a self-declared domain king. In the year 1995, he purchased his first domain name LipService.com for $100 and sold the same after 8 years. He, also sold Men.com, for $1.32 million (Rs.9,32,55,500) which was a limelight sale and reported worldwide. From the above story, you can have some benchmarks for your self. However, investment (any kind) is a skill which needs to be developed by individuals which take time. have a look of this video, to get an idea of how high-value domain is sold. The above domain auction is for www.ad.com which was sold to an Indian Entrepreneur Bhavin Turakhia. As of now, I told you a few don’ts and now I’m going to tell you some action to perform (Do’s) to help you find your right domain investing strategy. If you’ve never brushed your teeth eventually you’ll get cavities in your gums, and no one wants a smelly breath or rotting teeth in their mouth. You have to brush regularly to maintain healthy teeth and good or hygiene. the same is true for your domain name portfolio hygiene practices. we’ve all been there, We had an idea and booked it and renewed it for year after year and after year and never received any in quarries on it. Now, you multiply that scenario by x10 or even x100 (depending upon the size of your domain name portfolio). When you have so many domain names and none of them is selling at right cost then you, my friend have got a situation which is out of control luckily you are here reading this article, and I will help you build up a right domain names portfolio. You should review your domain name portfolio either once a year or once a month and maintain a health domain name portfolio. All you have to do is ask your self these three questions to determine which domain name to keep and which one to drop. How long you own this domain name under review? If you only owning a domain name for less than six months, for example, you may not have enough data to determine if it’s worth keeping, because there’s simply may not be enough data.I always hold my newly acquired domain name for at least two to three years because in those three years I will have enough data back up my retail selling cost.And three year time will also back my data with average traffic in that domain name. For example, you may have a domain name called ellection2019.com which may have good traffic for the year 2019 but this will not hold good for next year. And I normally drop a domain name with no traffic from last five years and with no bids. This way I save lots of money on renewal cost. How many unique visitors does the domain name received per month? Backing up your point number one you should always track your traffic.For this I personally use http://www.google.com/analytics.When you have numbers you have the ball in your court and you justify your selling cost. Also, do the basic SEO optimization for every parked domain name in your portfolio and do follow all the google website ranking factor for your domain name. If donat gets enough traffic, even after parking your domain and following the basic SEO tips. Just Drop the domain name. How many offers did you receive on the domain name?It does not take 5 years to know if the domain name is worth or not?Now, assuming everything is done well and worked well for your domain name and you are getting less than 2 inquiries in a year then probably its time to auction the domain name at wholesale price in place of a retail price. Apart from the basic selling strategy “Buy Low and Sell High”. Domain investor should also understand two more words “Wholesale and Retail”. Suppose, you own a domain name and someone who is bidding on your domain name with the intention to resell, will look for the wholesale price. If you have a low performing domain name and you just want to recover your investment, then you can try putting your domain name in the auction at a wholesale price. If you know your end user and targeted person or company is having a plan to use that domain name, then you may consider selling at a retail price which is higher then the wholesale price. Generally, you have to wait longer to sell the domain name at retail cost. Do remember to price your selling cost with supporting numbers (like traffic your domain is getting or keyword search numbers). You can visit https://www.estibot.com/ to get estimated wholesale price for your domain name. You can park the domain name to parking page provided by third-party auction company like sedo.com.over here you can park your domain name and then also display your offer.This method is the simplest way to park your domain name with the option to sell. Host your domain name, with a website.Create a simple website with custom website design and get a web hosting for it, You can have one hosting plan for all your domain and use your design for all your domain.This way you have more control of your website and do better SEO for your domain name. Parking or hosting your domain name is a very important step for your domain portfolio. Because this will give an opportunity to your buyer for contacting you. Don’t ever just buy a domain name and pray that someone will contact you. As this will never happen. Time is the most important stuff here. You need to spend your time in the right manner. Spend your time reaching out to people who actually want to buy your domain for sale. you may have noted, as soon as you register a domain name with any service provider (and you have not opted in for domain privacy ), you will start getting lots of email from web designing company for a website. As soon as I register a company, I start getting an email from the company trademark registering. When I applied for GST number, I started getting emails from account management company. As soon as, I make my website online, I start getting a ton of email telling me about how bad my SEO is. What do I feel about it? Well, I HATE them and I am sure you will hate them too. Do not spam people pushing them to buy your domain name. Don’t do this kind of outbound marketing starry when its come to domain name sale. I received an email from one of my customer (Domain Investor) saying “I used a domain automated tool to generate 10000 email list from WhoIs of a domain name that is similar to his domain name. Imagine I am an owner of Netspaceindia.com and you own a domain name Netspaceshop.com or net-space.com both of these domain name are useless for me. Now imagine doing this thing 10000 times for your one domain. It is a guarantee that you will end up in the blacklist and maybe you end up paying can spam fine list. If you own a domain name, like “stockmarketinvestment.tips” which is a targeted domain for a keyword “stock market investment tips”.go to estibot.com (paid service) and generate potential buyers list by creating a list by keyword-based search. if you own stockmarketinvestment.tips do not target the person who owns stockmarket.com because for him it does not make sense. Goto Zfbot.com (Paid) and enter your keyword (start keyword and end keyword).Zfbot, will create a list of the domain name & show you if they are parked or not.If they are, then mostly they are not a business owner and they should not be added to your potential buyer mailing list. Visit a website which sounds like your website like stockmarketinvestmentips.com or invetmentstockmarket.info for which your website may be an upgrade. try a google search for a pattern by using *keyword* for example *stockmarketinvestment* this will give a list of the website with your keyword pattern.inurl:stockmarketinvestmenttips will give you a list of a website having with your keyword.next use allintitle:”stock market tips” which will give a list of the website with a same keyword-based TITLE IN THE URL, add those websites to your mailing list. remember the key trick is to handpick the website owner manually. type “stock market investment tips” in Google and Bing search engine and look for a paid search result. The company who is paying for your keyword is already aware of the importance of your keyword and maybe a good target buyer. If your domain name is brandable get over to https://www.crunchbase.com/ and https://angel.co/ and search for start company where your domain is an upgrade for them. if you own a killer single word domain like fire or open in .io .co .me .ai or simpler TLD get over to github.com and search for that keyword.Sometimes you find a user with simpler userid for that keyword or popular code base that may want launch website on your domain. don’t forget to get over to social media websites like Facebook.com or Instagram and do a search for your domain name keyword. You may find a fan page or a user matching with your keyword. look for hashtags with the matching keyword on Facebook, Twitter and Instagram. People using your keyword hashtag on regular bases may be a good buyer. The last tip is for old school people (Like me) goto yellow pages or magazine under your domain category. look for printed ads and see if they can be potential buyers. Now, that you have a list of domain names you can go look up for whois info manually and check for owners. remember you are not trying to boil the ocean, you are looking for buyers for whom your domain name will be an upgrade. your job is to create a smallest targeted email list and send email individually (not from bulk automated software ) track open rate to see if they opened your email one time or 10 times? because 10 times shows they may be interested in your domain name or may have forwarded your domain name internally for referring. By now, you know that selling a domain name to a right buyer is not an easy job. You have to do research a lot, create a mailing list, negotiate with buyers and in the end complete the transaction. This all required lots of hard work. Just like you in the real world, you have a broker to sell your property through the broker and the broker take care of all the process and documentation on your behalf. similarly, in domain name investment business, the portfolio owner may have 1000’s of domain names and he/she may not have that time to look into the process above. For them, you can be an online domain name broker. Get in touch with marketplace sellers and get in understanding with terms for doing all the hard work for them. And then you can start selling his/her domain name with no investment. This way you can also start building your capital for your domain name portfolio. To get hold of domain name investor in India, I highly recommend following https://www.domainx.org/ where can meet like-minded people and even sometime you can catch me around :-). I know what you are thinking after going through this long article. Noting in this world come easy, There is a price you need to pay for any kind of gain. To make thing simple you should ask a question. And the best place to ask the right questions are in the comment box below. I will be happy to answer your all query. Welcome to Domain Name Investment Business !! !